It’s a complicated task, this assembling a football team from scratch business. A task akin to a man gingerly walking a tightrope whilst balancing a precious family heirloom upon his head. So many moving parts, so many pitfalls, such small room for error. 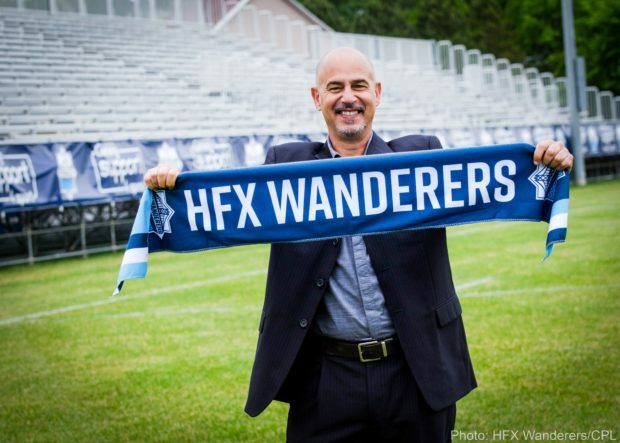 In Stephen Hart, HFX Wanderers fans will hope to be in safe hands. Here is a manager who has coached multiple age groups in Canada’s youth system, has managed the national team on two periods from 2006 to 2007 and 2009 to 2012, and led the Trinidad & Tobago national team from 2013 to 2016. A little closer to home, Hart has also served as the Technical Director for Soccer Nova Scotia. 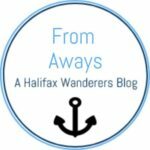 It’s this wealth of experience that Wanderers’ staff and players will turn to as they look for someone to assume the role of leader in these dizzy, early days of professional football in Halifax. On the surface at least, this appears to be a role that Stephen Hart has been subconsciously preparing for since arriving in Canada over 30 years ago. 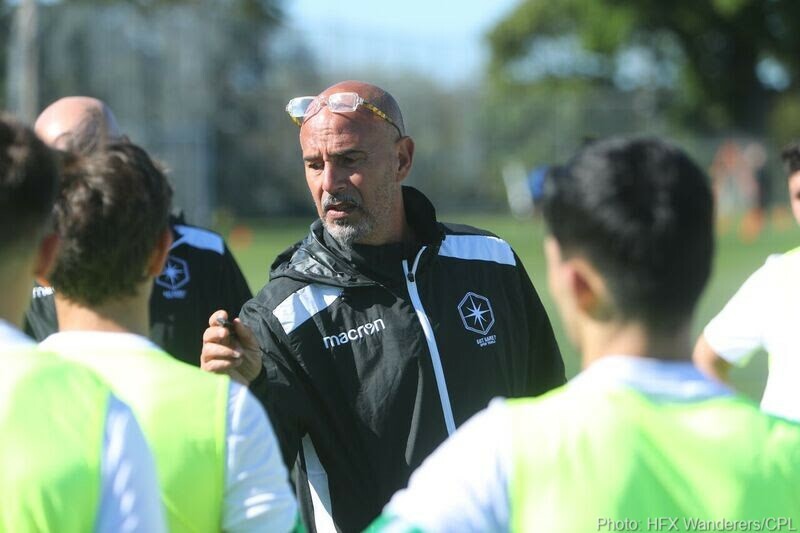 So, as we inch closer to April 27, and the first round of fixtures, I was delighted to get the chance to ask the HFX Wanderers’ coach some questions about how the club was progressing, what we could expect from the new signings, and his hopes for the coming season. In this wide-ranging interview, the boss was happy to provide some answers. Firstly, thank you for taking the time do this, Stephen. I’d like to start by asking you how the preparations for the season are coming along. Do you feel happy with where you’re at in terms of player recruitment and ticket sales? 3,000+ season tickets sold sounds like an incredible number to me. Very happy! The team behind the team has been working very hard to put all things in place and it is going very well with ticket sales and promotion of the team. Player recruitment has been very interesting, starting from scratch. So far, I am happy with the signings and the enthusiasm they have all shown to get started. Pre-season training will begin in March. Will there be a lot of the old-school non-stop running in the opening weeks, or do you like your players to be working with the ball from the start? Old school running is not preferable for me as pre-season is not a sprint, though some days it’s a part of training. We have to complete some testing first and that will determine who needs what individually. Then I will utilize a mix in the general physical preparation. I’m really interested in the fact that every single club is starting from scratch in terms of player recruitment. How do you go about assembling a squad when you don’t have a clear idea of the level they’ll be coming up against? Well not all are starting from scratch, but in general this is true. Correct, we do not have an idea of how each team will look. For me what is more important is how we look. Managers in the opening few matches will have to be proactive instead of reactive, simply because it’s impossible to be tactically tailored to face a team which has never played a competitive game before. How many rounds of matches do you anticipate it taking before you have a clear idea of the strengths and weaknesses of the other teams in the league? Difficult to say really! Some teams may come together smoothly, others will take time to get the relationships right. Most coaches will be very busy tweaking their own squads and learning about their players. The important thing within my own team, is creating the right balance. Do you think your player recruitment methods have to be a lot different to the other managers in the Canadian Premier League, simply because population-wise, the Nova Scotia talent pool is a lot smaller? Yes! Some teams have had relationships with an academy, League 1, PDL, or more recently national youth teams. This gives them an edge, or should I say a jump start. I know the Nova Scotia talent pool quite well, though I have to be honest and question the level of competition within teams for starting positions and the league in general. A lot of the players you’ve added to the squad so far have played with at least one other teammate in the past. Was this done consciously as a way of achieving on-field chemistry as quickly as possible? This was done deliberately. Relationships on and off the field always help players settle better. I thought the signing of the four Trinidadians was very interesting. Do you think there’s a bit of an untapped market in the Caribbean? Originally, I had several players in mind from the Caribbean and a variety from Trinidad & Tobago, but I could not sign everyone. If you look at Caribbean football nations, with respect to population and the number of players that play professionally, it is a bit eye opening. In 2006 when Trinidad and Tobago went to the World Cup, they had 24+ players plying their trade in the UK alone. It is not the same 12 years later, however the potential is still there. The majority of signings so far have been defensive players. Was it your intention to build from the back and work your way forward, or is it just a case of those players being the first ones you could negotiate deals with and announce? Not particularly, I wanted to secure Canadian players in certain positions first and then build around them. It’s just more a matter of how they are being announced. Were you aware of Akeem Garcia and Andre Rampersad prior to hiring Derek King, or were they players he introduced you to? Akeem I know very well. I first saw him in 2013 at the U17 CONCACAF tournament in Panama, and worked with him with the Trinidad & Tobago U20 squad. In conversation with Derek about his own team FC Santa Rosa, he mentioned a young player that was doing very well for him, so I began keeping tabs on him. Eventually, I saw him play a couple of games live and he did very well. Elliot Simmons and Scott Firth are both good passers who like to keep the ball and control the tempo of the game. Is retaining possession and playing with the ball important to you as a coach? Controlling the tempo of the game is very important because playing without the ball is very difficult in terms of influencing play, not to mention never enjoyable. Almost all the players I have signed are comfortable in possession. Now, during a game when they’re under stress, who knows how they will react. However, I will always encourage players to contribute to the possession of the ball. With regards to the full-backs you’ve signed so far, Zachary Sukunda and Ndzemdzela Langwa, both seem like very attacking players. Is that a position you see contributing more to the attack than the defence? Not at all! It is about creating a balance. When we do not have the ball, the objective of the entire team is to win it back, be it individually or collectively. Full-backs are no different, they should know how to defend first, then if they have the capacity to attack we work them into it. I think there’s a really nice squad balance at the moment between leaders (Williams, John, Hocine) and youngsters (Lamy, Firth, Simmons etc). How important do you think it will be for the younger players to have these established professionals to learn from? The learning curve is great. They have to learn not only aspects of professionalism off the field, but also what type of character it takes to progress in a highly competitive environment. This is the toughest part, especially with young talented players today. Most have never had to compete for a starting position day in day out. Among the Canadian players signed by yourself and the other clubs, do you think there are many with a realistic chance of making the national team squad over the next few years? 2026 must be a target for a lot of them. That is not a question I can answer. However, there have been a few signings that I have always felt should have been given the opportunity. Canada’s soccer landscape has changed tremendously, not to mention the impact the MLS and USL (in Canada and USA) has had on providing opportunities for Canadian players. However, those leagues do not belong to Canada, and not enough Canadian players were being exposed. Canada’s depth chart is presently quite impressive, so let us be fair. Coach Herdman and his staff are still finding their feet. However, this is exactly what the CPL is designed to achieve, the league will contribute to the depth chart, by providing a professional opportunity and pathway for young Canadian players. And finally, tongue in cheek as this question may be, one of my favourite players growing up was Dwight Yorke. He was playing for Aston Villa’s first team while I was playing with their U11 youth team, and he was a player we all tried to imitate in training every week. As a player you’ve worked with before, is there any chance you could lure him to Halifax? I’m sure, even at 47, he could still come off the bench and do a job! Or more realistically, in a coaching capacity. Good for you, imitation is the best form of flattery! Dwight remains in incredible shape. I know him quite well, from age 12 and even back then, you could see his passion and desire to be one of the best. I have not spoken to him about coaching. From the outside looking in, and knowing Dwight’s competitive tenacity, I believe his coaching ambition is focused on coaching in the UK. You never know though! Thanks for your time, Stephen.